Our key focus is empathy, support and psychoeducation, we offer a tiered structure developed by Geraldine Scott, our Founder, to challenge OCD. You will see these three stages detailed below and the pace and participation can be chosen by yourself for your comfort and compatibility. As the source of our meetings can be based upon what our members bring to the group discussion and one’s progress can very often fluctuate, the following tiers can be flexible and therefore one can choose or move between the stages they would like to focus upon. 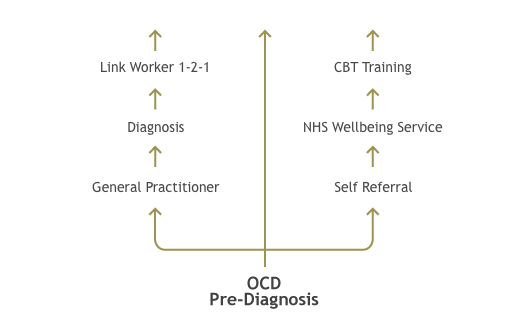 These meetings provide an ideal environment for sharing any issues and questions relating to OCD and, the tiered structure offers a positive and constructive way towards moving forward. During the last seven years, I have gained an enormous amount of knowledge, understanding and insight by attending the meetings run by the Norwich and Norfolk OCD Support Group. I would highly recommend them.